The ArcGIS Address Data Model represents the current best practices and strategies for storing and maintaining address data in the geodatabase at ArcGIS 8.3 and beyond. This diagram [PDF-4.57 MB] illustrates how address data from various spatial data sets at the city of Calgary, Alberta, Canada, was integrated into a single geodatabase. An ownership parcel can have several addresses, each for a different purpose. A single address can be shared by a parcel, one or more buildings, and a landmark. A street can have many names or addressing schemes assigned by different authorities. An apartment building can have many addressable apartments. The ArcGIS Address Data Model is a template upon which an organization can build a single repository of names, addresses, and zones that can be assigned to all addressable features. Rather than scattering pieces of address data throughout an organization's spatial data holdings by storing address data as attributes on features, this repository contains a single instance of each name, address, address range, and zone found in the organization's jurisdiction. Any number of addressable data sets can be integrated with this repository through the use of geodatabase relationship classes. 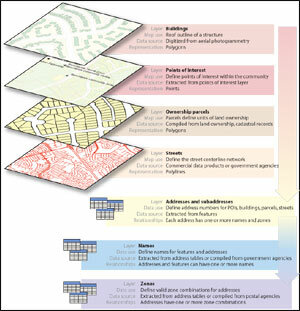 For more information on the ArcGIS Address Data Model, including a sample geodatabase, visit support.esri.com/datamodels. Why Is an Address Data Model Important? There are three main reasons why a data model for address data is important. 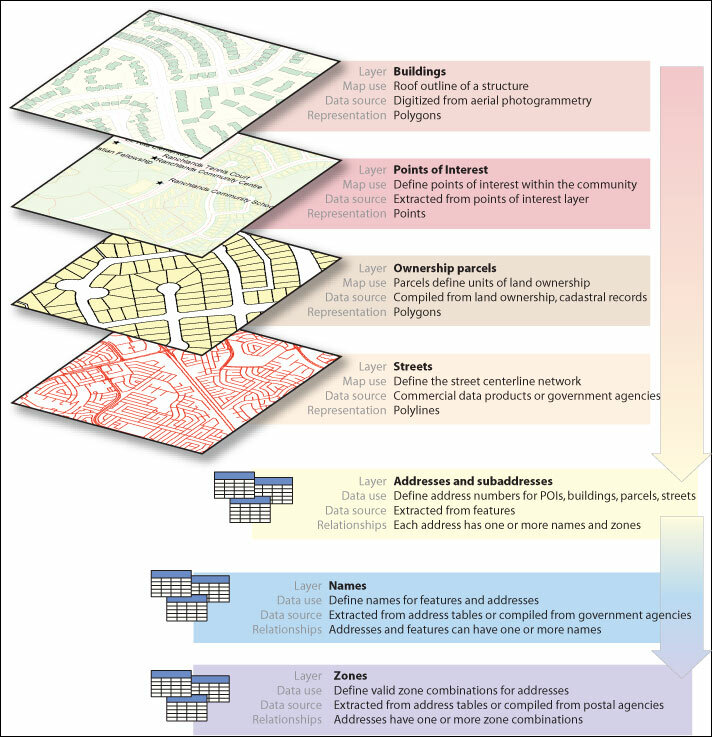 First, GIS users have long been unable to manage more complex address requirements within a single system. This will make that possible, make address management simpler, and reduce redundancy. Second, the ArcGIS Address Data Model is used to extend other data models, such as ArcGIS Land Parcel, Census, and Transportation, to support integrated storage and maintenance of address data. Third, an address data model can serve as a basis upon which disparate spatial data sets maintained by different agencies can be integrated through common address information. The contents of a single repository of address data can be populated and shared among many departments within an organization or among many different organizations. Such a repository can also be used to integrate address data management through many levels of government, from local to national, providing a comprehensive source of the best available local knowledge of address information.